"Thank you to the amazing GTA Online community worldwide – and especially all of you enterprising Criminal Organization bosses masterminding missions from your Bunkers, marauding in your Weaponized Tampas, and boosting through the skies on your Oppressor hyperbikes – for your incredible support for the massive Gunrunning update. In the summer weeks and months ahead, we’ve got lots more fun modes and high-octane vehicles coming your way – starting with today’s special Independence Week drop featuring a futuristic new Supercar, an intense new mode, patriotic liveries and more." In Los Santos, when it’s time to make a profit you do whatever it takes. In this case, that means parachuting from a chopper in the dead of night directly into a crossfire, using thermal and night vision to identify and gun down the opposition, and working with your team to track down the crate containing your tax-exempt profit margin. Time to make the deal. Gun down your enemies under the cover of darkness as you race to track down highly coveted contraband in Dawn Raid, the newest mode added to GTA Online. Two teams of up to six parachute into a combat zone in search of a transmitter hidden inside of a package. Your objective is to find it and transport it to the evacuation zone. Armed to the teeth and aided with Night and Thermal Vision Goggles, you must utilize the Trackify app to locate the correct package. But be careful, using Trackify makes you vulnerable to enemy fire. Put those multitasking skills to the test in Dawn Raid and earn Double GTA$ & RP in this new Adversary Mode through July 10th. Raise the flag, put your hand on heart, and wipe that red, white and blue tear from your eye – a wave of Independence Day mayhem is erupting across San Andreas. Firework launchers, classic outfits, the Western Sovereign and the Liberator Monster Truck are all back through July 10, and 25% off their original price. Plus this year also brings patriotic new liveries for your Mobile Operation Center and Mk II weaponry to help you flaunt your love of country. Make some noise for Independence Day in style. Simply log in to GTA Online at any point between now and July 10th to unlock both in-game styles of the Rockstar Noise Tees that debuted at the Rockstar Warehouse this week. 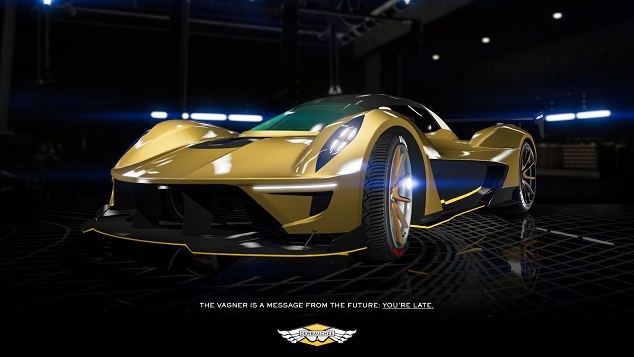 • Time Trial - "Storm Drain"
Vagner Supercar, Dawn Raid, Independence Specials - A new supercar, adversary mode, and Independence Day bonuses and discounts.